This week we sit down with Little Rock, Arkansas Designer, Tobi Fairley and discuss, how it all began, how she runs a successful business, what inspires her and of course, blogging. 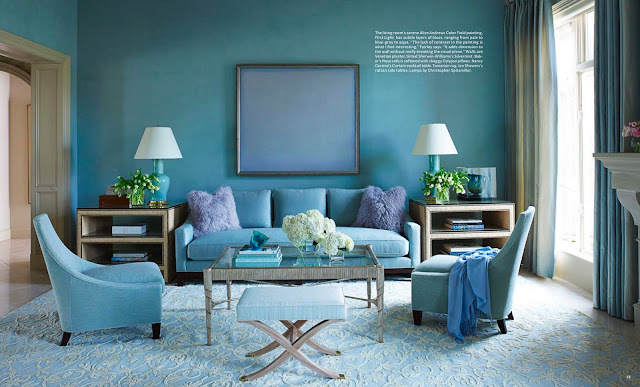 Tobi was selected by Traditional Home Magazine as one of the Top 20 Young Designers in America for 2009 and was recently featured on House Beautiful's March '10, cover showcasing her Blue Room. Pull up a chair, grab your beverage of choice, and listen to Tobi share with us her story ( in which she makes it all sound so easy ). Each of these has been a hard act to follow and yet y'all get better each time. To Ms. Fairley: We're not worthy! Thanks so much helping us understand the profession a bit better. This brings two things to mind from my own experience. First: Job one for the pros was gaining our confidence. They were so good at their profession, so good at selling their ideas, and so good at relating to us. They put it this way: "The jumping is hard, the falling is easy." Once we jumped, it was fun. Second Ms. Fairley reminds me of folks who can "remember every golf shot they ever made." If she plays golf, she probably remembers every shot. "$250K just doesn't go as far as you think it will." I'm personally touched by Ms. Fairley's comments about avoiding jealousy of wealthy clients. I grew up in a smallish southern community where everybody kind of knew everybody else. We all knew the rich folks and what they did. In general these were the brightest, hardest working, usually the nicest folks in the community. Their money and skills ran the hospital, the Salvation Army, the YMCA, the churches, the school boards et al. They supported talented, hard working folks wherever they came from. And they know who needed help. Fantastic interview with Tobi, if all of us could be like her our lives I'm sure would be fantastic. You know that most designers and artists usually don't like to have to deal with the financial side of the business, but Tobi has achieved this perfectly. Are all American women like this? Just so you all know, I love listening to the three of you talk, it's my little link from Australia to you girls in the U.S. Each interview gets better and better. I really enjoyed this interview with Tobi. I am from Arkansas as well . I am a designer with a new blog and feel like a sponge. I could feel the yearning from the three of you when she talked about budgets. I love how honest and direct she is. My goal is to incorporate (maybe in baby steps) her strategy into my presentations. She is eliminating so much frustration that goes with our profession on the front end. wow! awesomeness! i love this! Now, I congratulate Ms. Fairley on her success in 11 short years in Interior Design, but this cover photograph was my least favorite of HOUSE BEAUTIFUL'S in a long time. It is a formula room with no soul. It has beautiful things...lovely quality, but everything in this room is new. It cries for anitiquities! It screams for warmth....anyone else feel that way? Thank you ladies for continuing to bring us the best listening ever! She "is" honest and direct, and how refreshing is that? Why be anything else? What an amazing woman and good soul. Fabulous interview. Thank you so much for this wonderful interview with Tobi Fairley. Your questions were wonderful and she was so honest with her answers and shared her business savy openly. I really enjoyed the interview and it inspired me to revamp how I approach client presentations. Great interview. Obviously, Tobi Fairley is extremely well-prepared, educated, charismatic and charming, in addition to talented. A true Southern Lady!! I love the lamps--but wonder if investing in antique chinese porcelain lamps wouldn't be an option. Spitzmuller (sp?) lamps (colors, glazes, shapes and fabrication techniques) all seem to derive from the antique chinese. Just an idea. Thanks for a great hour. First time commenter, long time listener! . . . what a privilege to hear from a designer of this caliber. Her candid and open nature was refreshing, and I so enjoyed hearing about the process she goes through with her clients. Thank you so much for conducting another great interview! So happy to hear what Tobi says. We met her in Vancouver last year and I admired her so much that I said I would move and work for free just to be with her in that gorgeous office. She is an inspiration. Thanks girls for the SRT, a great way to learn and be entertained. I really enjoyed this installment! As an interior designer with a relatively new business, it is so refreshing to hear Tobi's candid insights and your probing questions and topics. Truly helpful. What a charming southern talent! I really enjoyed listening! I looked at Tobi's website and the rooms are truly beautiful, but everything seemed to be new, and I couldn't really get a read on any of the homeowners personal lives. I would like to know what the three of you think, should a room be designed to be only beautiful, or to reflect the family living in the home? Do they travel, do they collect, are children in the home, what special pieces have remained with them over time? That was an amazing interview. I similarly went to business school and decided that design was my passion. It is so nice to hear someone who is doing well and not complaining about circumstances. She is creating the business she wants and nothing is standing in her way. By far, the best interview I have heard from a designer, as well as the most useful. Great interview! I'm about to go back to school for a degree in I.D. and I swear I'll probably learn more listening to all of you and your fabulous guests than I will in school. Keep 'em coming! Having watched Tobi's career growth for many of those years, I can confirm how dynamic and visionary she is...and just plain hard working. Glad to hear the good ideas she's sharing, she's tapped into the design pulse. Thank you for bringing another great interview. I throughly enjoyed hearing about Tobi's design processes. It was so interesting to hear about price points,they are seldom discussed. I would love to be able to consult with a design studio on one aspect of a room; say draperies. So I hope her idea to work with smaller budgets works out. It was also a great plug for getting an education; to back up all of that talent. Looking forward to the next Skirted Round Table. Just discovered your podcast and Im so impressed to finally find a great Interior design podcast. Thanks so much for sharing your views and getting some great inspiring people to come and chat with you. I'm sorry you took Stephen Drucker's bait and are devoting a program to his editorial. I think this is exactly the result he wanted: publicity for his magazine. His premise--that design has been hit by a wave of meanness--is just trumped up to get people talking. Internet meanness has nothing to do with design. Every blog, no matter what it focuses on--politics, sports, sexuality, pop culture, celebrities--is going to be full of angry commenters. It's the nature of the Internet, and the nature of the times. I have to tell you how much I loved this interview. Tobi was so candid and I feel that I learned a lot and I kind of feel you three did, too. I first bought the House Beautiful issue because of Tobi's cover and am now a subscriber. BTW, I'm a $1,000 sofa gal but I enjoy dreaming and incorporating designer touches as much as I can. It's the inspiration that you share that is so special. Thank you. Anon- we are NOT having Stephen Drucker on. We are only discussing his premise about rude anonymous commenting. Care to listen to next week? You might find it funny and interesting. I hope so!!!! This was absolutely fantastic! I had planned on having this interview on in the background while getting some work done, but I became so enthralled in her every word that I just sat here like a sponge soaking it all up! It's so incredibly enlightening to hear her design process. Lately, I've hit a "slump", I guess you could say. Maybe "burnout" is a better way to put it. But perhaps it's because I'm approaching the process with my clients all wrong. I'm ALLOWING them to micromanage, and frankly, that takes all of the fun out of it for me, to the point that it's almost become drudgery lately to do my work. I'm going to take this weekend and develop a new plan...a new approach for working with clients based on the information I've learned here. Wow...I'm feeling a renewed excitement! This is great!! What a wonderful honest conversation! Tobi, thanks for being so willing to share your business sense with us all. Best wishes and continued success! I don't give more than one choice in the first presentation, either. As I have said before; do they want my design or theirs? i listened to this entire roundtable and it was fabulous! thank you for the "sneak peek" inside the life of an upscale designer....and the reasoning of how a project can cost so much. i found it very interesting and intriguing :) it is fun to hear all your voices! simply stunning! I love the use of different hues of blue! turquoise is my favorite color, it can make anything beautiful! soothing, bold, gorgeous! Joni, Megan and Linda- Just getting to listening to this right now! What a lovely talent Tobi is, and her blog and TV appearances are terrific! And she loves New Dawn roses - how can you not love her? Thanks for a great interview! Is design becoming a bloodsport?